Pues resulta que los neoyorquinos Hospitality se nos han hecho mayores. O se nos quieren hacer mayores. Estoy de acuerdo con la crítica de Hipersónica en que los chicos no tendrían por qué haber dado un salto tan cualitativo con respecto a su álbum de debut. Con Trouble, parece que efectivamente, quisieran que la gente les tome más en serio. Del Pop desenfadado y juguetón de aquel debut hemos pasado a un disco mucho más reflexivo, ante un disco en el que han querido ampliar horizontes sonoros e instrumentación, dando entrada hasta ambientes ochenteros inspirados por teclados muy ad hoc (Last words,Inauguration), o desarrollos que son casi improvisaciones (Sunship, Call me after, Nightingale). Un recurso que, a nuestro entender, lastra demasiado a Trouble, un disco que habla de asuntos cotidianos, de la inmensidad del espacio, reflejadas en imágenes como las del océano. Un álbum que hubiera resultado mucho más llevadero si se basara en temas como I miss your bones, Rocket and jets o la deliciosa It´s not serious, que nos retrotrae a las composiciones más juveniles e inspiradas del primer trabajo del trío de Brooklyn. “The result is a follow-up that makes a point of showing its listeners the difference between “beautiful” and “cute.” There are moments of real beauty on Trouble: A 90-second trumpet feature that soars brightly over an acoustic guitar line that rises and falls visibly like a burly man’s chest (“Sunship”), or the sort of instrumental spawned more by a willingness to let things meander than by technical ability (“Sullivan”). On the latter, cymbals crash as if in slow motion, pianos pipe up at just the right spots, Papini’s voice croons, and guitar lines manifest out of thin air. The whole thing moves in and out as effortlessly as taking a breath, whereas other parts of this album are distinctly not easy. “I Miss Your Bones” recalls the squirmy riffs of Television, and as cool as toughness looks on Hospitality, they’ve only reached that place following extensive live touring as a rock band. There are a few fun, poppier songs here, too. The appropriately-titled “It’s Not Serious” is a welcome respite to the crescendoes and the instrumental wing-spreading abundant onTrouble. Here’s where we get a taste of that Tracyanne Campbell thing, just a hint of life in a time gone by. But unlike Campbell, Papini’s filling in her sharp observations with recycled imagery, singing here of photographs stashed under the mattress and waiting by the telephone for a guy to call. A Brill Building piano line gives the track a sense of time and place, a façade that’s smashed by “Last Words”, a mostly instrumental song more in line with the saxalicious closer on the most recent Bon Iver album than a Phil Spector production. It’s punctuated with 80s-style synths, another prominent addition to Hospitality’s overall sound. Sometimes, like on “Last Words”, it goes a little too far into dated territory, but in general the variety is a welcome addition. 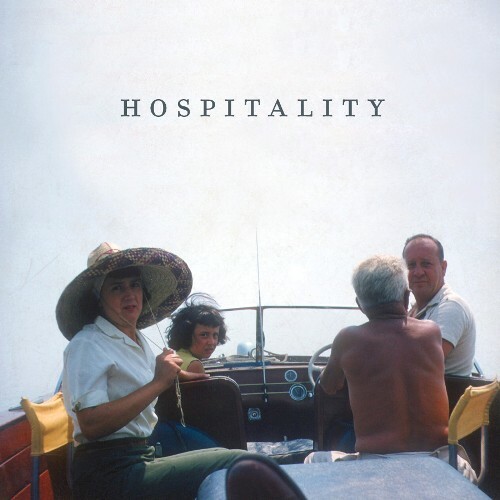 La música de Hospitality tiene algo de íntimo, de cálido, de tierno en su concepción, que hace que la audición de este Lp de debut sea una labor altamente amena, agradable, fácil de llevar. Su Jangle-Pop de libro, esa manera suave de entender el Pop hacen de este disco uno de los importantes de lo que va de año. Temazos desde el comienzo del álbum: Wetty Wang, Eight avenue, Friends of friends, Argonauts, Julie, Sleepover, The right profession, The birthday… Todo un crisol de sonidos, dentro de su sencillez, pues los arreglos son simples pero efectivos, y su instrumentación la justa. En su tarro de las esencias, el combo liderado por Amber Papini ha sabido mezclar los aromas del Twee-Pop filtrado por Belle and Sebastian con los momentos más líricos de The Delgados. Como anécdota, desde su sello dicen que Amber aprendió a cantar con el acento inglés de Bernard Butler oyendo el Talk Talk Talk de sus Psychedelic Furs. Lo cierto es que los neoyorquinos han elaborado un disco en el que todos los temas, del uno al diez, tienen una bonita historia que contar, tienen unos sentimientos a flor de piel que afloran en cada estribillo con la dulzura y la ternura de la banda que empieza, aunque Hospitality tienen ya dos Ep´s a sus espaldas. Un disco, en definitiva, que no deberías perderte para no dejar nunca de lado ese sentimiento tan simple y tan sencillo al que llamamos belleza. The NYC-based trio recorded the album almost a year ago, then shopped it around and signed with Merge last fall. Some of the tracks (Papini wrote all of them; she plays piano and guitar, too) were re-recorded from their sparse 2008 EP, produced by Karl Blau, which was also called Hospitality. The LP was produced by the band’s guitarist/drummer/keyboardist Nathan Michel (he and Papini are married) and Shane Stoneback, who’s had his hand in the honeypots of Vampire Weekend, Sleigh Bells, and Cults. The not-new songs here don’t sound reworked so much as run through some kind of cartoony scrubbing contraption, Wonka Wash-style, emerging stunningly clean out the other end, the curvy surfaces all gleaming in the sun. “Betty Wang”, apparently a tribute to one of Papini’s old day-job colleagues, has been especially improved. The original sounds like it was recorded in a bathroom under the lingering threat of whinging roommates, with frumpy drums and Papini fighting back a yawn; now there’s a brash, almost bratty energy, Papini hamming it up on the rollercoasting, “If you leave New York/ I don’t care, I don’t care!” line in particular, teased by real live electric guitars, trotting drums, twinkling keyboards. What’s lost is Papini’s raw vulnerability and delicate guitar-work (“Half an Apple”, one of the EP tracks not carried over here, built around her meandering vocals and spare finger-picking, has more than a bit of a Laura Marling vibe).